The pictures today were... well... let's say that the most positive adjective I can think of is amusing. I really, really wanted to get a great picture of Sadie's dress. 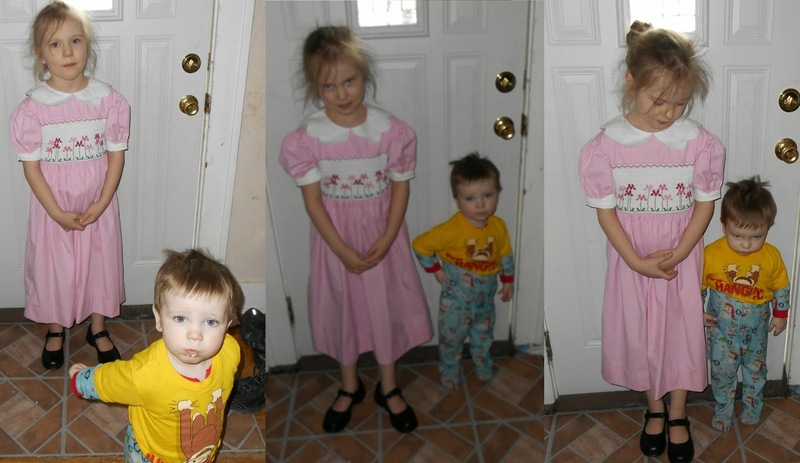 It's an amazing dress that I found on Thred Up back in winter (you can still get $10 off your first order and there are a ton of things on there for less than $10, which is one of the reasons I'm such a fan), but the kids, who had me to get the camera out and take a picture they weren't exactly cooperating. Do you see how he's mimicking her? And I have no idea why he kept pulling his shirt up and tucking it in like a half shirt. He really did look normal (with pants and a sweatshirt) when we were at Mass this morning. So it wasn't a total loss. Maggie (who amazingly changed out of her sleeper this morning with minimal crying) slept through the photo session, however I did get a few pictures of her on our way home from Mass in the car, while we waited for Daddy to return a destroyed baby gate... thankfully Lowe's agreed that a metal baby gate shouldn't be able to snapped in two by a three year old, even if that three year old has super human strength. And so that is what we wore for this first Sunday of Lent, where we had a relatively peaceful Mass (Mae spent most of it worrying about not moving so her socks wouldn't touch her pants, because she didn't want her Dora socks to be covered up). For more What I Wore Sunday stop by Fine Linen and Purple!